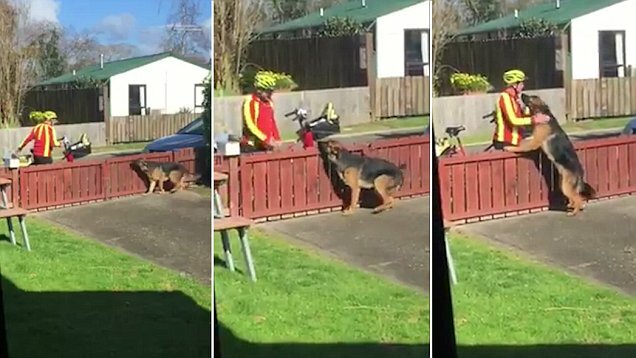 The owner of a fearsome looking German Shepherd has secretly recorded the postman cuddling the dog as part of his daily routine. The friendly German Shepherd who is misunderstood by the public as an aggressive dog due to his large size lives with his owner, Michael Collins in Tarungain in New Zealand’s North Island. According to Mr Collins, the unidentified mailman makes sure to stop by his property every day to spend some time with the dog even if he has no letters or packages to drop off. As the mailman approaches the front gate the German Shepherd is seen leaping from its spot to greet the mailman. ‘Everyday whether or not we have mail this mail man always stops to see my dog who is only nine-months-old,’ said Mr Collins. ‘He always gets over looked as a dangerous or unapproachable dog, maybe because he's big I am not sure. He doesn't bark at them or growl. ‘But this guy here always makes an effort to get off his bike to give him a hug and a pat!’ Users on social media applauded the mailman for showing affection to the animal and the gentle nature of the puppy. ‘What a gorgeous Shepherd! Such a beautiful nature - and hats off to the nice Postie who spends the time with him,’ said Toni. ‘That’s awesome. I know for me I am very standoffish of bigger dogs but to see his tail wag as soon as he saw the postman was very cool. Awesome to see this,’ Michelle said. Responses to "German Shepherd's owner secretly records the postman cuddling with his "ferocious" dog"
brilliant i have a 13 stone akita, and he is a soft giant as well.